"Back in 2011 when we started building Jolla and Sailfish OS, former Nokia directors told me that we need at least 100 MUSD to build a mobile operating system. Jolla has now raised 70 MUSD in six years with five funding rounds. We have spent tremendous amount of time doing fundraising, while the company has constantly suffered from shortage of capital, and early investors haven’t had a chance to exit. I started thinking ways to fund startups in a more efficient model to address these problems, and Zipper was born." 9.4M USD of the total has been funded by the Finnish Funding Agency for Innovation Tekes, a governmental agency in Finland, between 2012-1014. The most part of Jolla's funding has been received later from angel investors at least in China, Russia and Italy. In 2011, Jolla was put up in the heritage of Nokia's Meego, an operating system found great by the users especially on Nokia N9. 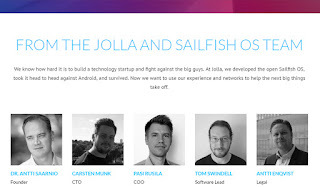 Jolla developed Sailfish OS based on Linux / Mer / Meego and introduced it a few years later in November 2013. Their own mobile phone model "Jolla" was launced in Europe, and reached top 5 sales in one of the operators list in Finland in its first month. Jolla continued for four years having both software development and hardware development in their focus, trying to push through their 2nd device "Jolla Tablet". Few hundred were produced, but more than 9000 interested customers were finally left without a device despite the fact that the tablet was awarded "The Best Tablet of the year" on Mobile world congress. This only shows how hard the competition is - it's not that Jolla didn't want to deliver, but it seems that struggling with the financing and production at the same time just didn't do. Most of the individual contributors of the Jolla Tablet are still waiting for their refunding, but Jolla has not forgotten these people - they recently updated their blog about the issue, promising the 2nd half of refunds to be paid as soon as the company is profitable, aiming to continue refunding on July 2017. Obviously seeing the whole hardware business too competitive and too rough, Jolla reduced their size and narrowed their focus to software development only. Their idea is to develop Sailfish OS as the rival of Android and licence is to mobile device manufacturers for income. As you can guess, this isn't easy either. Most of the big manufacturers are tied to Google with their current agreements, preventing them to introduce competitive operating systems too easy. For example Mozilla's Firefox OS was put on ice already, and Mozilla is a lot bigger company compared to Jolla. But still, Jolla goes on, looking for partners. Jolla's first licencing partner was Intex from India, introducing a mobile phone "Intex Aqua Fish" running on Sailfish OS. No sales numbers have been released, but at some point the phone simply went out of stock at Snapdeal who was the exclusive sales partner of "Jolla India"
Their second licencing partner is Inoi from Russia, who launched the sales of "Inoi R7" running on "Sailfish Mobile OS RUS" just a week ago. This phone is shipped with the latest update, yet unfinished version 2.1.1.12 of Sailfish OS. Jolla's future in Russia seems pretty safe, while they were chosen as the substitute for mobile operating system in governmental level in Russia's effort to reduce the market share of Android in their operating system markets. Jolla was chosen over Samsung's Tizen OS by a working group in the ministry of communications and was presented as the best alternative, but they didn't yet manage to ensure any governmental funding there. Instead, angel investors were found, some of them now sitting also in the board of directors at Jolla. Efforts on licensing are also taking place in both Africa and South America but Jolla has been quiet about these initiatives lately. Instead, another interesting project with Sony Open Device Program should be updated in couple of days. Sony Xperia X: It's yet unsure if this will be another community device for developers, similar to Jolla C, or a global launch of a new Sailfish OS phone. The launch of Sony Xperia X with Sailfish OS was originally promised by the end of June 2017. Delays matter a lot in the mobile industry, while the big companies keep on launching new models with the latest hardware. One can't fix a delayed product just by lowering the price tag if the customers have already been shown another direction. The funders are also expecting the promised schedules to be kept - or the next round of financing will be even harder. According to Mr. Saarnio, Jolla has spent all too much time on fundraising already during the past years. Great sales of Inoi R7 (already licensed) and Sony Xperia X (if licensed) would boost things up and give confidence to both the current and new investors. The operating system has received several updates and bug fixes during all six years, and it definitely has earned its place in the market. Start-up Jolla is still delivering in big league with constant tuning of sails. Focus. Financing. Limited resources. The smaller size enables agility all right, and the sea is big, but does a sail boat really fit into the sea of mobile industry crowded by huge carriers. 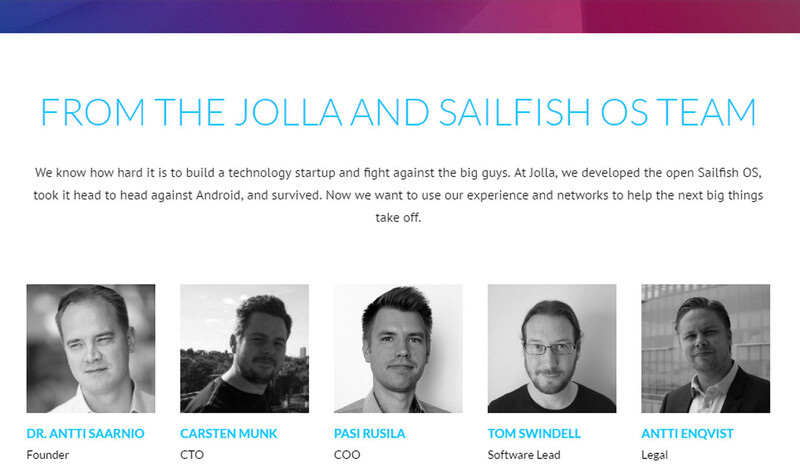 Jolla is one of the few at least trying. Sail On! Any hints or clues when we might see the next SFOS update of 2.1.1.12? Anyone interested in a Jolla phone?